What started 14 years ago with Marcus and his brother, Sam making a yearly Holiday album for their grandmother, has turned into an annual tradition for our "family" here in New York City. Year after year, we find a new way to explore seasonal tunes that we know and love, and find fun, inventive ways to explore the music of the season. The christmas projects have taken numerous forms throughout the years including original arrangements, improvised songs at the piano, live video shoots, full studio productions, and being captured in a single computer microphone.  With the creation of Charging Moose Media, we decided to make this project a little bigger. Gathering friends from various projects and places, we have created an 11 track album of both classic hymns and carols heard in new contemporary arrangements, and original Christmas tunes. This album is the culmination of 14 years of fun and art shared among our community of artists and the journey that we’ve taken from learning to play our instruments in middle school through learning/honing our craft in college to becoming working professionals in the New York City music scene. With performances from New York theatre alums (Spring Awakening, Once, Fun Home, Spamilton), The Voice contestant Gabriel Violett, red carpet staples such as Matt Rodin (Broadwayworld's School'd), New York music artists (Common Jack, Cast Party, Whiskey and Wine), songs composed and arranged by veterans of theatre, film, and radio (NBC's The Voice​, NPR's This American Life, Unlock'd), and more, this album is sure to be a staple in your holiday rotation.